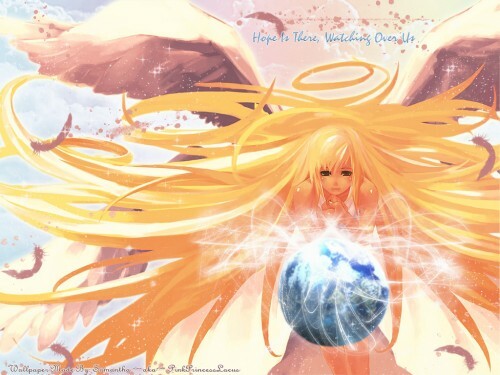 This is my first anime angel wallpaper. It has been my dream to submit one because I just love angel scans. :D .
I wanted the theme of the wallpaper to be that the angel represents hope itself, that Hope is always there watching over us all. Taking care of us with her prayers and her power of light that surrounds us all, and telling us to never give up. I want to thank my Best Friend Starr!, who once again gave me some great advice on this wallpaper. I used the brushes from Devianart.com, thanks to them as well. Comments are ever so much always welcomed!. oh sam i love this..its so pretty i love the scan you used and the background..*smiles*..you are so talented. Kyaa~! It looks superb lovely! XD You've made the Earth look so peaceful with all those light strand whirling around it :) Lovely! I completely love it! Your wall is so pretty and I like the choice of colors! All those lights around Earth makes it look so peaceful! hmmmm lovely work indeed, great wallie. ahhh. im the night walker T_T you hit me on the spot! >.< anyway, i saw this at FOE and OMG! I love the hair, the wings! good first winged wall! I luv it! yada, yada, yada! niiiiiiiiice! heheh Ive already commented too much on this wall...lol. Hurry up and submit your kira and lacus one! The close up one and the one with them in the clouds. Great job on your first angel wallie! It is really nice! You know what i am lost for words when it comes to this one. It is just so beautifull. I really do think you almost out did yourself this time. Well keep up the good work. OMG! I love you work Pinkprincesslacus! XD I think that's my favorite of your works! I love your idea and your BG is so wonderful, this cute angel is so peaceful! you're message is so good in this wall! Conveys the messge you want to the people. Thanks for the wallp. It really is beautiful.